I attended the CPD “Stop Trying to Look Good Coach” course with Magdalena in London after completing the CTI Co-Active Coach Core Curriculum. The 3 day course was impeccably organized and the agenda was pitched perfectly towards Coaches with experience. Magdalena is very knowledgeable about Coaching and has a warm, extremely professional and spacious style of delivering her curriculum, allowing each of the attendees the time and space to contribute and learn. Many new tools were introduced over the 3 days, with demonstrations and time to practice each of them. 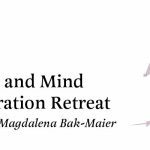 I thoroughly enjoyed the 3 day course and would recommend Magdalena to anyone looking to further develop themselves, their organization or their coaching practice.